As one of most recognized history critics in Japan, Mr. TAKESHITA Yoshirō (竹下義朗; *1967, Tokyo) began his researches on genealogy of world's monarchal and royal family history started with the 124 generations of Japan's Imperial Family. This accomplishment was then followed by more intensive researches on broader areas of Japan's history. 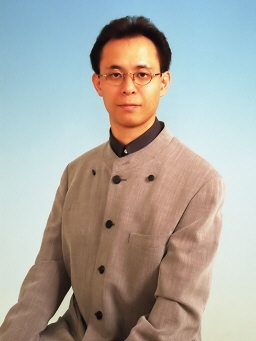 In February 1997, he opened a website the "Teikoku Denmō Show"(帝國電網省;Imperial Internet Agency). The series of articles "Reconsideration of the History" on the website deals with historical and political topics in various aspects including historical events within and around Japan from the ancient time to the present which general school books avoid to deal with, Japan's historical Emperors, and current international events. Under the motto, the "Revisionist TAKESHITA Yoshirō instructs the truths of the history which Japan's educational system never deals with," he suggests objections in his articles to the "generally spoken" history by revealing hidden historical facts. He is one of the earliest frontiers of the recent movement in Japan to "grow out of the postwar sentiment." The English version of the "Teikoku Denmo Show" started in January 2001 (with assistance by MATSUDA Shintarō, and IWAYA Bunta since 2006). He is one of founders of the joint authorship blog "Nittai Ichiu ~Japan and Taiwan: One united community~" (日臺一宇) since February 2005 that topics on the present and future relations between Japan and Taiwan. His commercially published books include Unapproved by the Government --- Historical truths excluded from school books (『検定不合格　教科書になれなかった史実』; Raiin Publishing Co. (雷韻出版): July 1999, Tokyo), Unapproved by the Government --- Historical truths excluded from school books II (『検定不合格　教科書になれなかった史実2』; Raiin Publishing Co.: November 2000, Tokyo) and Know your enemy "China" --- the true colors of the anti-Japanese nation under a mask (『汝の敵、中国を知れ』;Raiin Publishing Co.: July 2005, Tokyo). He has also written articles in books and magazines such as The Challenge from Cyberspace (『サイバースペースからの挑戦状』 ; Raiin Publishing Co.: December 1998, Tokyo), The Attack from Cyberspace (『サイバースペースからの攻撃』 ; Raiin Publishing Co.: May 1999, Tokyo), and I/O Cyber X, No. 11 (『I/O別冊　サイバーＸ　No.11』 ; Kohgaku-sha Co. (工学社): February 2000, Tokyo). The Teikoku Denmo Show website was introduced in the magazine The History Book vol. 54 --- the Hazardous Bibliography of the History, the "Ancient History and Legends" (『別冊歴史読本54号　危険な歴史書「古史古伝」』; Shin-jinbutsu-ouraisha Co. (新人物往来社): Oct. 2000, Tokyo). He is currently a lecturer of the Water Vision School (Shimizu town, Shizuoka prefecture) where he gives a course of lectures entitled the "Takeshita's Reconsideration of the History."